Ikea is the go-to furniture store for great deals on everything from bed sheets to lighting and hot dogs. But if you really want to save money at Ikea, you'll need to do more than just show up at the door. Timing your shopping trips, hunting down coupons and planning for dinner at the superstore are just a few ways to save time and money when you're on a quest for that perfect nightstand. Follow these tips to cut even more of your costs as you shop. You might be most available on weekends, but as with most stores, Ikea is busiest on Saturdays, said savings expert Kendal Perez of CouponSherpa.com. With so many people lugging big items through checkout and into their cars, shopping can feel like moving -- in a crowd. That's why, if you want to save yourself some valuable time, it's most important to do your shopping during the week. "To avoid the crowds, shop during a weekday, especially Tuesday or Wednesday," Perez said. The earlier the better, so grab your coffee and plan to be done by lunch. Another trick? Enter through the exit, Perez suggested. That way, you dodge the impulse buys near the entrance. Ikea offers budget-friendly pricing on just about any household item, but to save the big bucks you'll need to be patient, Perez said. "Ikea offers seasonal savings, much like other retailers, so it's best to research deals and promotions ahead of holiday weekends," she said. This year, keep an eye out for Ikea's Kitchen Sale, which started in March last year. In late December, you might see up to half off select items in the store's Winter Sale. Don't forget about Ikea's Black Friday sale, either. In 2016, the event ran from Nov. 23 through Nov. 29 and included savings like 20 percent off bedroom mirrors for Ikea Family members. Ikea Family is the store's loyalty program, and it offers various perks, like exclusive deals. Perez said Ikea Family members enjoy occasional offers like 20 percent off toys, 25 percent off glassware and serving plates, and 20 percent off rugs and baskets. Each month, one randomly chosen Family member from each store wins a $100 gift card. Family members also get free coffee or tea during their visits, plus discounts on select food ideas and more. Best of all, the program is free to join. Another source for great savings is the store's email newsletter, Perez said, where you can pick up exclusive deals. And don't forget to check coupon sites for discounts. "For example, CouponSherpa.com recently had a printable coupon for $25 off your $150 purchase through Dec. 24," Perez said. She also suggested picking up discount gift cards. GiftCardGranny.com has Ikea gift cards on sale for up to 10 percent below face value. 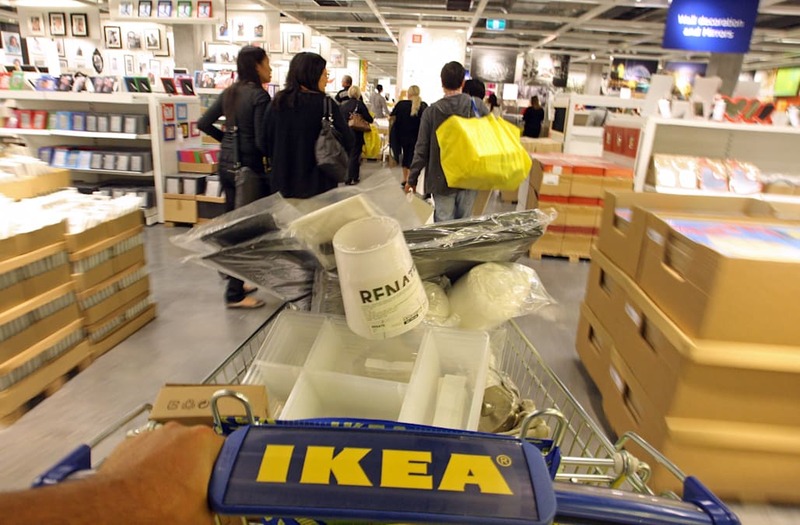 If you live near Ikea, visit the store rather than shop online. Yes, strapping a mattress to the roof might be a bit of a hassle, but Ikea's shipping charges can get pricey, Perez said. Still, fees do vary by region and order, she said, so if you must get something shipped, make sure you research your options. Small item delivery starts at $10, while large item delivery by truck starts at $99. However, there is one perk to paying for large item delivery: Once you pay the fee, you can make as large an order as you like without incurring additional delivery fees. Your purchases will be placed in the room of your choice, too. If you're moving to a new city with an Ikea store, sign up for the Big Move Break Down program. By filling out a simple questionnaire, you'll receive $25 off your next $250 in-store purchase. That could help you furnish your new pad while you save money on moving furniture. Preparation is key to saving at Ikea, said Benjamin Glaser, editor with money-saving site DealNews.com. Go online and read user reviews of products you're eyeing, especially if you're shopping for Ikea furniture. Glaser said that since much of Ikea's self-assembly furniture is made from pressed wood -- which is simply wood chips pressed together -- it's not as durable as solid wood. User reviews could alert you of furniture that can't handle daily abuse. If you need sturdier items, look to Ikea's line of solid wood furniture. It's pricier but often a better deal than at other retailers. Once you do find Ikea items you want, Perez said to make a list using the site's My Shopping Lists feature. The tool tells you the exact location of the item you want, she said. That way, you can save yourself some time and go directly to your items without getting distracted. While you might not get the gourmet, white tablecloth service you're craving, you will find good deals on food. For instance, for a select time Ikea Family members were able to deduct their food bill from any purchase over $100, Perez said. Other deals include a smoked salmon sandwich or harvest salad for just $4.99. Or, if you just want a snack, frozen yogurt is $1.50 and two hot dogs and a soda goes for $2. Of course, if your diet or budget don't allow for this type of fare, Perez said to make sure you eat before you shop. "The power of Swedish meatballs is not to be trifled with," she said.